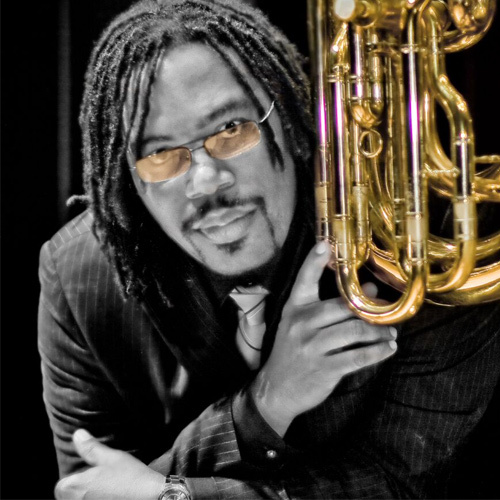 With over two decades of performing on the world’s classical music stages, tubist Richard White has matured into a musician known for his clear sound and stylistic flexibility. He began his tuba studies with Ed. Goldstein at age twelve at The Baltimore School for the Performing Arts, where he graduated with honors. He then went to the Peabody Conservatory of Music to study with David Fedderly (Principal Tubist, Baltimore Symphony) where he received his Bachelor’s degree. On the advice of Mr. Fedderly, Richard traveled to Indiana University to study with the legendary Professor Daniel Perantoni. He continued his studies there receiving both his Master’s and Doctoral degrees. Dr. White held the position of Principal Tubist with the New Mexico Symphony Orchestra from 2004 until it’s untimely demise in 2011 and is currently in his fifth season as Principal Tubist of the New Mexico Philharmonic. Richard enjoys teaching at the University of New Mexico, where he is Associate Professor of tuba/euphonium, and Associate Director of the Spirit Marching Band. Dr. White has performed with the Canadian Brass Quintet, Indiana University Faculty Brass Quintet, New Mexico Symphony Brass Quintet, Baltimore Symphony Orchestra, Colorado Symphony Orchestra, Indianapolis Symphony Orchestra, Malaysian Philharmonic, Santa Fe Opera, Sphinx Symphony, Spoleto Music Festival U.S.A., Music in the Mountains, a summer festival located in beautiful Durango, CO, and many others. Dr. White is an Adams Artist, and performs exclusively on these instruments. Prior to moving to New Mexico, Dr. White was one of the top freelance musicians in the Indianapolis area, where he recorded with such greats as movie film composer John Williams, Cincinnati Pops conductor Eric Kunzel, and the late great wind ensemble conductor Frederik Fennell. Throughout his musical and educational career development, Dr. White has had a passionate interest in motivational speaking. That dream has recently materialized itself with the launching of his website rawtuba.com. Sharing inspirational thoughts and philosophies that have motivated Dr. White has taken him to Mexico, South America, Europe, South East Asia and across the United States of America – with more engagements on the horizon.